When a resident at the Aloe Village Senior Complex in Galloway, NJ called a local news station for help with 50 to 100 feral cats that were overrunning the community, she had no idea it would lead to the senseless death of six newborn kittens. Ironically the tragedy opened the eyes of the residents to the sad dilemma feral cats face and is bringing the community together to work with cat advocacy group, Alley Cat Allies to save the lives of the remaining animals. The innocent call from a woman named Evelyn about feral cats using residents’ porches as bathrooms, leaving foul odors and biting one senior citizen prompted an immediate response to the complex by Raymond Lane of Animal Capture and Control Services. With traps in hand, Lane, Evelyn and a news crew walked around the complex inspecting the situation. 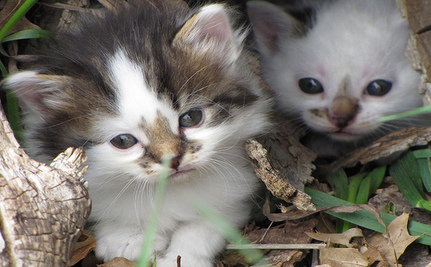 Noticing rustling under a bush, Lane crouched down and pulled out six tiny kittens that were only a few days old. Later that day all six of the kittens were euthanized. The group offered their services to property managers at Aloe Village to organize a Trap-Neuter-Return program that will spay/neuter and vaccinate each cat and assist with adopting kittens and friendly cats. The community readily accepted the plan. Evelyn and the other neighbors were thrilled with the news. No one at the complex had ever heard of TNR programs, but they are now happy to help. When Alley Cat Allies inspected the complex they found cats living in two basic areas that can be easily contained. And they reported that far less than 50 cats live on the property. The group began trapping cats immediately, capturing eight on the first day. Thank you for helping. It is a shame that the animal control couldn't be truthful and honest from the beginning. If they had, maybe someone would have helped and the outcome would have been different, Thank you TNR for your help and compassion. Au moins cette triste histoire aura généré quelque chose de bien. Peut-être que cet événement permettra aux gens e cette communauté d'acquérir une plus grande conscience face aux animaux.